"your winnings will be affected within 24hrs"
Hello, I am Miss Young. I received this story about Lottery fraud from a friend. Let me call him Muhammad. Hope you are fine but now I am hope less.So as a my well-wisher I have inform you to my tropical history of a false lottery winning. One day just received an e mail as a won of European Union International Lottery International Winners/Prize Award Notification. Avenue De Tavern 35/37 B-1040 Bruxelles, and final selection.Ref.Number 213/4356/66 Batch ID :13/5260/HL Pin Number : 1007685437. After received the email I was so much rejoiced that I won the above lottery and they claim a large of euro as transfer fee and processing cost. According to their demand I transmitted the amount as a stupid because I already informed only one concern authority for any lottery program then I contact to the gaming control board and reply from there I am a victim. At present circumstances can I get any help from your corner.I will be highly pleased if you kindly give me a proper solution whice is needful to me. As a ready reference I am sending herewith attachment of all document individually I.e.1st to lasts correspondence between scam lottery authority and me for your kind information. I am eagerly awaiting a reply from you. AVENUE DE TERVUEREN 35/37 B-1040 BRUXELLES. We are pleased to inform you of the result of the winners of the EURO STAKES (EUL)LOTTERY euro lottery programs held on the 31st of July,2005. This promotional program takes place every Summer( Yearly) with participants were selected through a computer ballot system drawn from over 20,000 company and 30,000,000 individual email addresses and names from all over the world, the lottery sponsored by leading Software Companies in Europe and America in promoting awareness and patronage of their software packages. Your e-mail address attached to ticket number 0767--45363763--254 with serial number 2015--05 drew lucky numbers 44-5647-567 which consequently won in the 3rd category. You have therefore been approved for a lump sum pay of 1,500,000.00 euros (One Million, Five hundred thousand euros) in cash credited to your file with the Ref. Number: DH/4167/05 and Batch Number:13/5260/HL. This is from a total cash prize of 18.000.000.00(Eighteen million Euros) shared among the Twelve international winners in this category. Due to mix up of some numbers and names we ask that you keep your winning information confidential until your claims have been processed and your money remitted to you. This is part of our security protocol in order to avoid double claiming and unwarranted abuse of this program by some participants. We hope with part of your winning you will take part in our next year 36 million euro international lottery. Congratulations!! Once more from our members of staff and thank you for being part of our promotional program. Fake passport based on a stolen passport. Note that "Alonzo" is not left-aligned with the other lines. These "e-mail address" lotteries are all fraud. The email accounts in the email are free email accounts. The phone number is a mobile phone. Also note that the email was sent on November 18, and it says that the "winning" must be claimed before November 15! You will be required to fill a "Lottery Claims appraisal Form? And send back with a photocopy of your international passport. Or drivers license as a proof of identity (The form can be found as an attached below) after download, Kindly prints, fills, and send back either by fax or as an email attachment. The Verification Form allows you to indicate the mode of payment you will prefer, note that our aim is to serve you better. Ascertain the authenticity of a lottery winner. The processing of your claim will be completed within four (4) working days and subsequently you will receive the total sum of One Million five Hundred Thousand euro � (�1,500,000.00). Please also note that NON RESIDENCE/CITIZENS will be required to make a NON DEDUCTABLE. Advance payment of the cost of Processing, Legal Swift Update and transfer charges fee, the payment� must be paid and an official receipt obtained this will enable a hitch free swift transfer to your provided bank account. Prior to European Payment Policy Regulations. Note that your total prize claim of � 1,500,000.00 has been insured to the real value and as such cannot be deducted from. This is in accordance with section 13(1) (n) of the national gambling act as adopted in 1993 and amended on 3rd July 2002 by the constitutional assembly. This is to protect winners and to avoid misappropriation of funds. Certificates of prize claim along side other vital documents will be sent � to you via Courier service immediately transfer of your winnings is affected. I wonder why they cannot remember the name of the lottery. Is it "EUROPEAN UNION INTERNATIONAL LOTTERY", "EURO STAKES (EUL)LOTTERY", "European Lottery scientific Game Promotion" or "European Lotto International" ? Thank you very much for your kind Co-operation. I am sending herewith the vital documents as are asked for to supply. E �mail attachment Application/payment processing form E-23 and my International passport being no. XXXXX (total 06 attachment file) two times are sent here with for your kind perusal and necessary action. I would request you kindly to sent the Certificate of prize claim along side other vital documents through courier service to me with a intimation to XXXXX, XXXXX, XXXXX. This is just avoiding future complicacy and ensures the source of remittance. Western Union receipt. 1,818 Euro to John Cole. Dear Muhammad. We would like to inform you that your funds is now with the bank, ready to be transfer to your bank account. 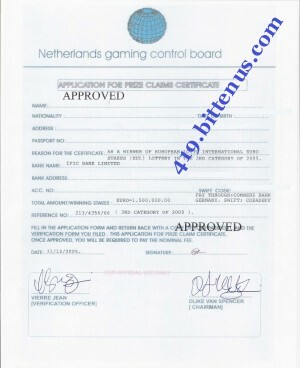 But before this fund can be transfer you have to get the certificate of award from the Netherlands Gaming Board. We have attached here a copy of the application form please fill this form and send back to us immediately, so we can get the certificate for you and the bank can then make the transfer. Muhammad receives a document from "Netherlands gaming control board" with some APPROVED stamps, but he also receives a letter asking him to pay another 5,584 euros! At this point Muhammad realized that it was a scam, and he did not pay any more money to them. 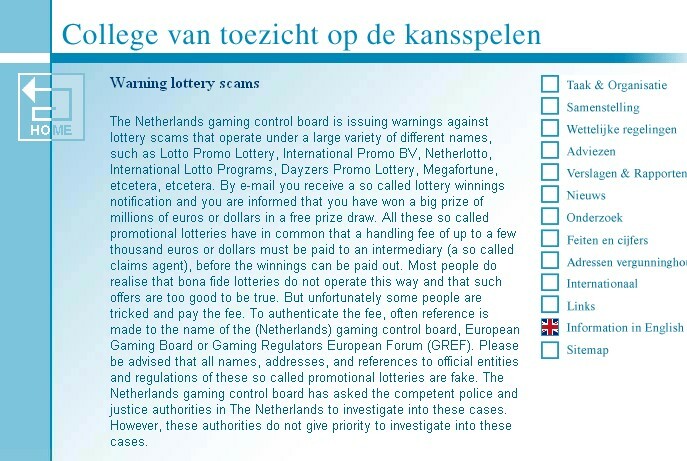 Warning lottery scams The Netherlands gaming control board is issuing warnings against lottery scams that operate under a large variety of different names, such as Lotto Promo Lottery, International Promo BV, Netherlotto, International Lotto Programs, Dayzers Promo Lottery, Megafortune, etcetera, etcetera. By e-mail you receive a so called lottery winnings notification and you are informed that you have won a big prize of millions of euros or dollars in a free prize draw. All these so called promotional lotteries have in common that a handling fee of up to a few thousand euros or dollars must be paid to an intermediary (a so called claims agent), before the winnings can be paid out. Most people do realise that bona fide lotteries do not operate this way and that such offers are too good to be true. But unfortunately some people are tricked and pay the fee. To authenticate the fee, often reference is made to the name of the (Netherlands) gaming control board, European Gaming Board or Gaming Regulators European Forum (GREF). Please be advised that all names, addresses, and references to official entities and regulations of these so called promotional lotteries are fake. The Netherlands gaming control board has asked the competent police and justice authorities in The Netherlands to investigate into these cases. However, these authorities do not give priority to investigate into these cases. Muhammad received a new Lottery winning letter on February 11. This time he did the right thing. He ignored it.